Posted on March 1, 2018 at 6:12 am. WOLF PACK PRIDE continues with the WMS Model UN Club. The team did a fantastic job at the William and Mary Conference last weekend — debating difficult issues with MUNers from all over Arlington, and developing solutions for a better world. Way to go, MUNner wolves! [clap] Model UN participants are reminded that the Sidwell Friends Conference is coming up soon. Ms. Carlson with have additional details at your next meeting NEXT WEEK. And now to the WMS sports program. The boys Wrestling Team will be “going to the mat” against the best competition in APS today — at the Arlington County Wrestling Tournament, hosted by Kenmore Middle School at 1-o’clock. The Wolves are coming off a big win last week, and look to keep that momentum going all the way to final buzzer. Now let’s root them on to victory, and Be a Part of the Pride! Go get ’em, wrestling wolves!! [clap] Wrestlers competing in the tournament are reminded to meet at 10:48 THIS MORNING for the ride over to Kenmore. Good luck, boys!! It’s nearly time once again for Parent-Teacher Conferences! Conferences will be held “Arena style” TODAY from 4:30 – 7:30 PM, and TOMORROW from 7:30 to 11:30 AM. Tell your parents that they can meet with ONE or ALL of your classroom teachers. No appointments are necessary, but meetings are limited to 5 minutes each. Parents and teachers together — what could be better than that?! Due to the conferences this afternoon, ALL after school activities are CANCELLED: clubs, groups, teams, intramurals, EVERYTHING. Also, there will NOT be a late bus today, so students are reminded to catch their ride promptly after school — or make other arrangements to get home. But on the bright side, there’s NO SCHOOL TOMORROW!!! So enjoy the long weekend! This is an important announcement for all 8th graders who are going to Arlington Tech for High School next year: Tech teachers will be coming to Williamsburg next MONDAY morning to help get your registered for your 9th grade classes. The session will begin at 8am during Wolf Time in the ____________ — and be sure to bring your iPad. See Mr. Tuttle with any questions. 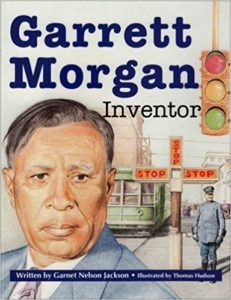 Meet Garret Morgan — an American inventor from Kentucky. Back in the early 20th century, Morgan developed a pair of inventions that remain important even today. 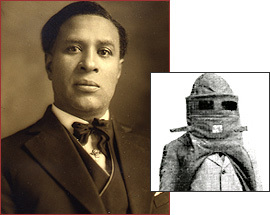 In 1914, he developed a “safety hood” that protected users from dangerously polluted air. His design led to the development of “gas masks” that saved countless soldiers from chemical attacks during World War One. And in 1916, his “safety hood” enabled firefighters to rescue 32 workers from a collapsed tunnel under Lake Erie. But that’s not all! In 1923, he patented the first 3-light traffic signal — which greatly reduced accidents on roadways across America. He sold his design to General Electric for 40-THOUSAND dollars — a HUGE sum at the time. His efforts truly make him a Champion of Change! ANNABEL: Hey guys, it’s me again, Annabel, and I’m back with The Podium. Even though the Olympics wrapped up on Sunday, there are still plenty of storylines for us to explore. A big one this year was — CHEATING! Before the Winter Olympics in Pyeongchang even began, the games were embroiled in CONTROVERSY. The Olympic Committee discovered that Russia’s entire Olympic program had been cheating for YEARS. Specifically, Russian athletes were “doping” — which means using performance enhancing drugs to get an advantage. As a punishment, Russia was BANNED from competing as a country in the Winter Games. However, in the interest of fairness, a select few Russian athletes were still allowed to compete. But they did so under the OLYMPIC flag, not the Russian flag. All together, only 169 Russians were allowed to participate. They won 17 medals, two of them gold! But that’s not the end of the story. During the games themselves, even after Russia was banned for doping, two MORE Russian athletes testing positive for steroids — a bobsledder and a curler. UN. BE. LIEVEABLE. According to a number of the Russian athletes, winning a medal in these games was bittersweet: they were happy to win, but sad that they couldn’t celebrate beneath their own flag. Looking ahead, the Olympic Committee has still not ruled on whether Russia will be able to compete in the 2020 Summer Games in Tokyo, Japan. Hopefully, Russia will clean-up its Olympic program and just let the athletes compete fairly. That’s it for the Podium this week, I’m Annabel. Just keep skiing WMS!